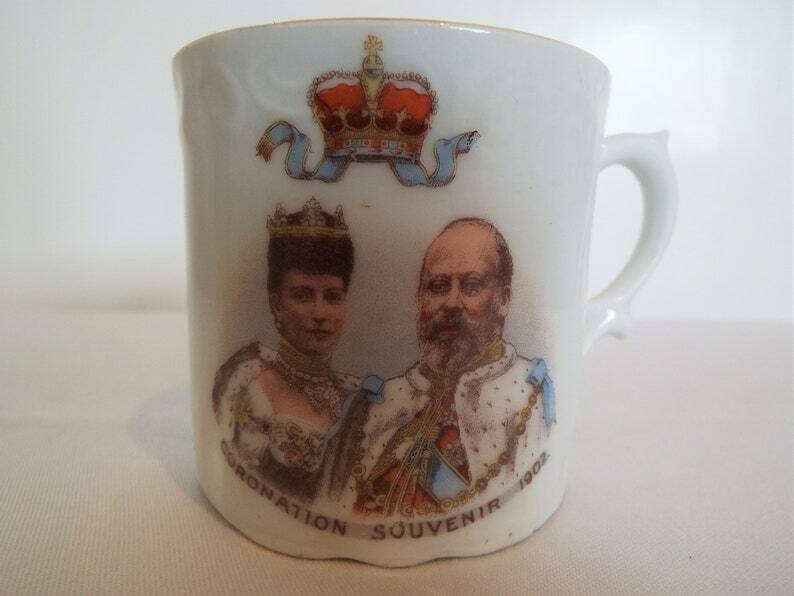 This special and very pretty coffee can (mug) dates to 1902 and was produced in England to commemorate the coronation of King Edward VII and his wife Alexandra as Queen Consort. It is a very elegant and beautiful shape, with a very elegant handle and bright white colour. It features a transfer printed picture of the King Edward VII and Queen Alexandra in their coronation robes, underneath the coronation crown. Underneath are the words "Coronation Souvenir 1902" The outside has a pretty scrolling moulded pattern and a very stylish handle. The image of the Royal couple stands out brilliantly against the white china. During this era and earlier, this item was always referred to as a 'coffee can' and not a 'mug' for drinking coffee from. There is no maker's mark, but it is English and obviously Edwardian. Its in excellent condition, that its obvious that this mug was bought by a British person as a souvenir of this momentous occasion and treasured and kept safe in a cabinet. Royal commemorative pieces are relatively common, but good ones such as this are getting far scarcer and harder to find. It would make a lovely link to the Edwardian period, when Britain started to become less 'stiff upper lip' after the staunch rules of the previous Victorian era, for enjoying one's morning tea or coffee! In excellent antique condition, with no chips, cracks or crazing. The pattern is in excellent condition. There is slight minor wear to the gilding on the rim edge, but this is very minor and perfectly commensurate with age and use. Any further wear there may be is commensurate with age and use. Please ask for any further photos. Antique Jam Spoon. English Edwardian silver plated preserve spoon, By Dixon & Sons. Perfect for scones and jam at an afternoon tea party! Antique Jam Spoon. English Edwardian silver plated preserve spoon, By Francis Howard, Sheffield. Perfect for scones and jam at a tea party!